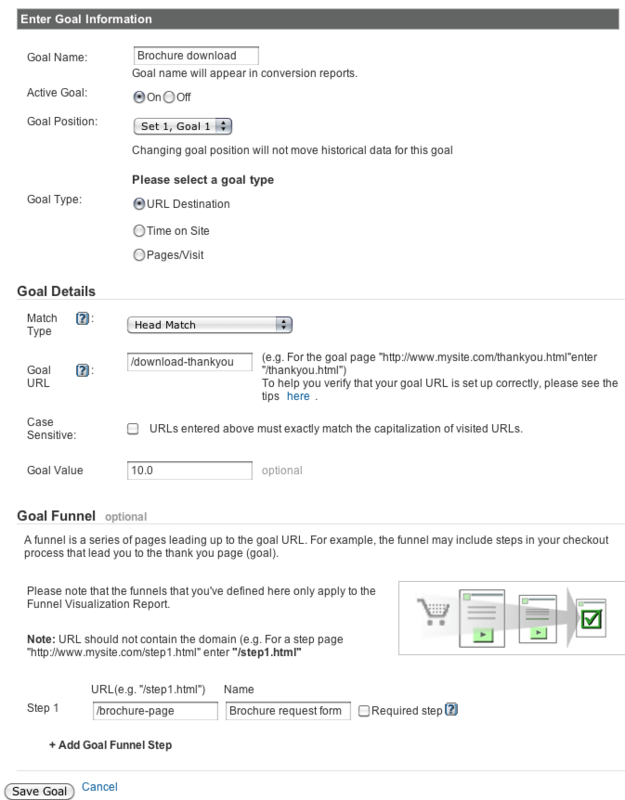 Goals in Google Analytics (GA) open a multitude of interesting and thought provoking questions when analysed properly. In this post I'll show how to select the right goals, showing why it's so important to apply a value to those goals to help with data-driven decision making. Within Google Analytics you have the ability to setup a specific action or interaction that can be used to calculate the flow of users within the site. You can setup funnels or just a single step funnel which Google Analytics can use to create a goal. Key to the principle behind goals is to understand what the users having been doing, in what order and trying to get an understanding on the the value generated to the business of their visit. Which Goals do I need? The king of all goals on any e-commerce website. When you convert that magical customer into a booking and therefore revenue for your business. So much of an analyst/webmaster/business owners time is focused on a single metric such as this. Creating this as a goal allows the user to view the flow of users through a pre-defined funnel which allows you to view any bottlenecks or potential issues with your booking process. If your site has a membership system in place monitoring the sign up process analysing the take-up of new users is a very insightful metric to have in your arsenal. Knowing where people navigate from when they sign up - when is the best time to get new members can help with a customer acquisition strategy. You've created an amazing e-book, an app or even a cool image, its your IP its why people come to your site, or maybe its just a little bonus you provide because you are such a nice person. Whatever it is or why you have it - you should want to record how many people download it - a goal is a great way to look at the volume and then look at how people are finding your special gifts. Your products are awesome, well atleast you think they are! Why don't you let other people tell you what they think. When they do this you can add some tracking code to the site and then you can monitor the performance of you reviews. Your latest blog post went down a storm - it was shared socially and went viral. The comments section was awash with questions, praise and smileys 🙂 You want to be recording the volume of comments you recieve and then you can use this metric as a form of social performance. 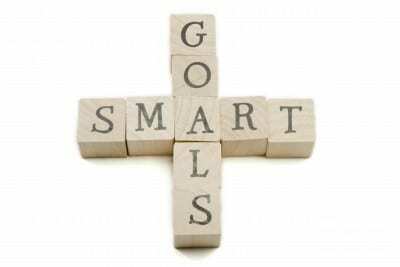 You will also find Dave's post on Using Event Goals useful for creating goals when there is no page associated with an action such as when someone downloads a file or shares a blog post. What Value do I associate with my Goals? Its not always easy to see why this is important since people think that if they already have a conversion rate to goal then that's sufficient, for example, a Conversion Rate on the payment page to confirmation of 40% against a Conversion Rate of the Package page to the payment page of 60%. Which should you focus your attention on? Which will have the biggest ROI? This is where goal value can help to show which outcome is generating the most business value. This is where you just apply a single value to all the goals - eg. put 1 or 10 as goal values - this would then provide you with a value that you can start to use to evaluate differences in how referring media or pages on the site are generating value. You can input your margin (or equivalent financial figure) into the value field - this would then allow you to pull out financially significant data. This again is the same value to all goals, therefore using the margin value as a constant. This could include the value of a lead on a business-to-business site. This requires some thinking, and understanding of the relevance of the actions however using a calculated or weighted value makes your use of goals more specific. This weighted view of the actions on your site will take some consideration - and you need to address it from the angle that you want to analyse the data from. Will you want to use it for pure sales, for brand awareness, social awareness, overall business effectiveness - answering how you will want to use the data will help you define the scoring. What you can also do is categorise the goals into sections so when you are using the scoring system you can communicate the goals as part of a larger categories. eg. Booking, Brand, Engagement etc. How do I use the findings to promote change? So you have been running goal values for a number of weeks now, you have nice graphs showing in your analytics package, but what can you do with them? This data is great for analysing the effect of split tests / multi-variate testing, or to create the reasoning behind testing in the first place. For example, if you have had your homepage for a while now - you will want to make some changes, but have limited development resource to do it. What would be the best thing to change first? Should you be testing your call to action as that has the clear connection to you're bottom line? But then again the blog gets a lot of traffic - maybe make the button to access the blog more prominent? Well lets look at the goals, bring up the homepage as the landing page - and lets look at the goal values for the homepage by next page. Here's another case where you might use goals. Say you have a number of different landing pages for your categories - they are all different designs, different coding languages, different layouts. How do you know what is effective and whats not workings. You want to combine the pages into a single template, taking the best features and allow the design to be flexible. One way is to look at the goal values and compare each page using multiple goal values. Which of the following sounds best if you wanted to convince your boss/client to make a change. "I was comparing the landing pages and page A performs better than B when we look at the goals we have setup"
"I was comparing the landing pages and page A has a score of 1450, whilst B only scores 1200"
"I was comparing the landing pages and page A has the potential to contribute £15,632 margin, whilst B only has £11,459 per day"
"I was comparing the landing pages and page A has a Conversion Score of 1200 a brand score of 150 and a engagement score of 900 whilst B only has 1000 , 120 and 600 respectively." Hopefully you are now considering using values in your analytics package and can help these you make more informed decisions. If you have any questions on how to implement or have any other questions please contact me using the comment section or via a social connection. Thanks to Russell McAthy for sharing his advice and opinions in this post. Russell is a Digital Marketing Consultant working for Stream:20. You can follow him on Twitter or connect on LinkedIn.